This True TSSU-60-16 Sandwich Prep Table has 12- 1/6 Size Pans And A Space For Condiments On The Right Hand Side OF The Unit. 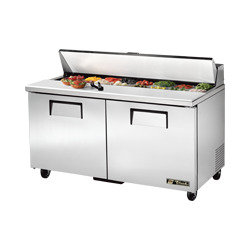 True’s commitment to using the highest quality materials and oversized refrigeration systems provides the user with colder product temperatures, lower utility costs, exceptional food safety and the best value in today’s food service marketplace. Oversized, factory balanced refrigeration system with • guided airflow to provide uniform temperature in food pans and cabinet interior. Patented forced-air design holds 33°F to 41°F (.5°C to • 5°C) product temperature in food pans and cabinet interior. Complies with and listed under ANSI/NSF-7-1997-6.3. Sealed, cast iron, self-lubricating evaporator fan motor(s) and larger fan blades give True sandwich/salad units a more efficient, low velocity, high volume airflow design. Condensing unit access in back of cabinet, slides out for easy maintenance. Exterior - stainless steel front, top and ends. Matching aluminum finished back. Interior - attractive, NSF approved, white aluminum liner. Stainless steel floor with coved corners. Insulation - entire cabinet structure and solid doors are foamed-in-place using Ecomate. A high density, polyurethane insulation that has zero ozone depletion potential (ODP) and zero global warming potential (GWP). 5" (127 mm) diameter stem castors - locks provided on front set. 36" (915 mm) work surface height. Stainless steel exterior with white aluminum liner to match cabinet interior. Each door fitted with 12" (305 mm) long recessed handle that is foamed-in-place with a sheet metal interlock to ensure permanent attachment. Positive seal self-closing doors with 90° stay open feature. Doors swing within cabinet dimensions. Four (4) adjustable, heavy duty PVC coated wire shelves 219/16"L x 16"D (548 mm x 407 mm). Four (4) chrome plated shelf clips included per shelf. Shelf support pilasters made of same material as cabinet interior; shelves are adjustable on 1/2" (13 mm) increments. 11 3/4" (299 mm) deep,1/2" (13 mm) thick, full length removable cutting board. Sanitary, high-density, NSF approved white polyethylene provides tough preparation surface. Stainless steel, patented, foam insulated lid(s) and hood keep pan temperatures colder, lock in freshness and minimize condensation. Removable for easy cleaning. Comes standard with 16 ( 1/6size) 67/8"L x 61/4”W x 4"D (175 mm x 159 mm x 102 mm) clear polycarbonate, NSF approved, food pans in countertop prep area. Also accommodates 6" (153 mm) and 8" (204 mm) deep food pans (supplied by others). Countertop pan opening designed to fit varying size pan configurations with available pan divider bars. Varying size pans supplied by others. 21/2” (64 mm) diameter castors. Barrel locks (factory installed). Requires one per door. 19" (483 mm) deep,1/2" (13 mm) thick, white polyethylene cutting board. Requires “L” brackets. 19" (483 mm) deep,3/4" (20 mm) thick, white polyethylene cutting board. Requires “L” brackets. 113/4" (299 mm) deep,1/2" (13 mm) thick, composite cutting board. Requires “L” brackets. 19" (483 mm) deep,1/2" (13 mm) thick, composite cutting board. Requires “L” brackets. Crumb catcher. Requires crumb catcher cutting board for proper installation. Exterior rectangular digital temperature display (factory installed). ADA compliant model with 34" (864 mm) work surface height. One year warranty on all parts and labor and an additional 4 year warranty on compressor.